2011 was the first year I had a garden. It was not really a failure, but it would certainly be an over-exageration to call it a success. This year I will do better. I will spend less time reading gardening blogs and more time actually gardening. I will (get my husband to) build a fence at the beginning of the season and not wait until vermin have eaten off every sprout in the garden…twice. I will not start and then transplant an entire package of tomato seeds just because they all sprouted. I will not plant 3 squares of radishes and I will pick them before they get too big. I will prune my tomatoes, who knew you were supposed to do that? I will freeze or can what we don’t eat, not just throw it in the compost after it starts to smell (no more rotten liquified cukes YUK!) I will build trellises and use cages instead of letting everything go willy-nilly. I will mark and remember where I planted things so I don’t accidentally dig the lettuce seeds up to plant more radishes. I will grow actual picking cukes for my pickle experimentation. I will pick my zucchini before it gets huge even though a huge zucchini seems like more of an accomplishment. I will not get emotionally attached and cry when small rodents eat my baby bean and pea plants. I will just go in on the community sweet corn field that our neighbor does instead of trying to grow my own and feeding every deer and raccoon in the area. I will photograph the process. I will actually blog about my garden. This is my planting plan for this year. I think I got the companion thing okay. My husband and I differ on gardening methods and plant choices. As a compromise, we stay out of each others gardens and keep most of our opinions to ourselves. It saves us a lot of trouble. If he doesn’t put in broccoli like he is currently planning on, I’ll replace two of my eggplant squares with broccoli. We also have a planter of mint, thornless raspberries in front of the house, and a formerly overgrown grapevine that I may have pruned too aggressively last week. I have a few concerns/questions…. My husband thinks the peas planted with sunflowers will pull the flowers over. I just want to see what will happen. Any advice on not having my peas topple my sunflowers? 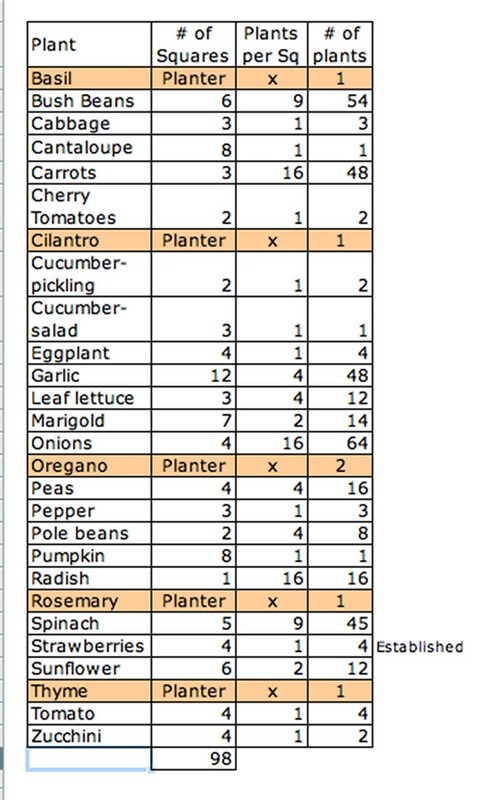 I’m worried that this may be an over ambitious plan fueled by spring fever and seed catalogs….. Are there any glaring mistakes or things that will be a problem? Thanks! I have staked out the outline of my “boxes” with baling twine and stakes, and dug my pathways, using the good dirt to raise the beds. (I am using half of my regular garden spot, just trying to be more efficient.) 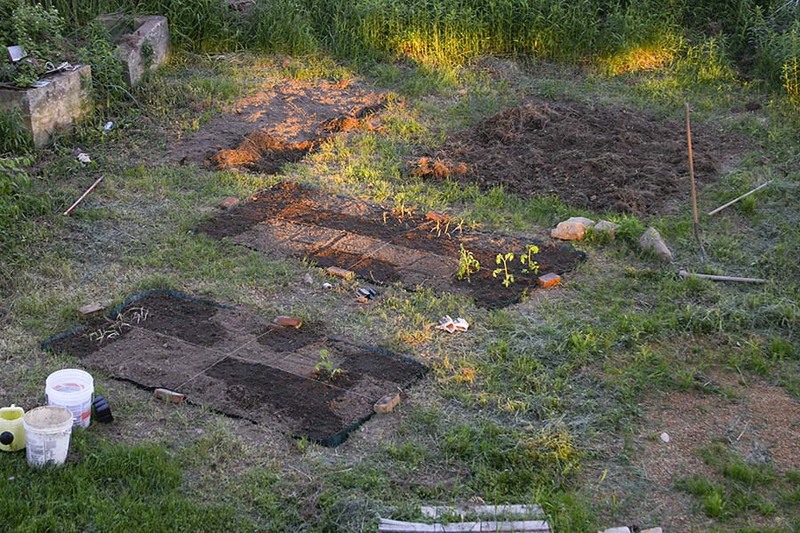 I was thinking of using wooden yard stakes laid in the dirt to temporarily separate my rows, and I’m so glad to hear that you just draw in the dirt…I figured I really only needed squares when I plant so I know where to plant the seeds/seedlings. I haven’t read the book, but all the information I’ve read online about SFG sounds terrific. I thought it would be worth a try, but with a twist. 🙂 Thanks for your input! After the picture above was taken I edged in my beds with salvaged bricks. I just wrapped twine around a brick on either side to divide it off. I did not put down a true grid (I know Mel says this makes it not a “real” SFG and I’m OK with that) I just divided it into quarters with twine and drew lines in the dirt for the rest of the squares. (you can kind of see that in the picture) This year I’m just eyeballing it drawing lines in the dirt as I go and using my layout to keep myself in line. It sounds like you’ve learned some great lessons–and I think there’s no better way! People ask me when to water plants, and part of me wants to respond “When should you have a drink? When you’re thirsty!” All the reading and planning is great, but some things you have to learn by experience. Dive in and soon it will be clear what adjustments need to be made. I think the most important rule is to try to improve one or two things each season, to increase gradually to avoid burnout. *You can plant garlic in the spring, but it’s best to plant it in the fall–like October/November. In a garden like yours, cover it with a good mulch and let it grow all winter. Harvest in about June. A good option if you want to use that space this summer is to grow more onions, green onions, chives, or garlic chives. 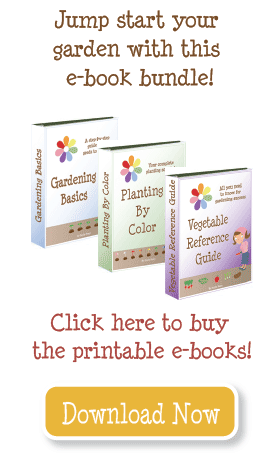 *Peas and sunflowers–I am interested to hear how this goes. Sunflowers are very tender, and cannot tolerate frost. They should be planted at most 2 weeks before the frost date. Peas love the cool weather, so plant them 8 weeks before the last frost. In my area (GREEN group) I plant peas in March, and harvest spring, and pull them up the first of July. I would plant sunflowers mid-May. So I am curious to see which is taller, the sunflowers or peas! *I like your cuke trellis, send me a picture when it’s growing! *Try growing your 4 tomato plants in one square on a trellis (prune religiously), but I’d also suggest finding another 4 squares to plant one tomato plant in a large cage. Then you can see which method you prefer. *Space your cabbage out a little bit–they need more like 1 1/2 squares each. But if you rearrange with your pumpkin and melons, you will be fine. The cabbage will harvest before the squash get big. Other than that, it looks great! Best of luck! 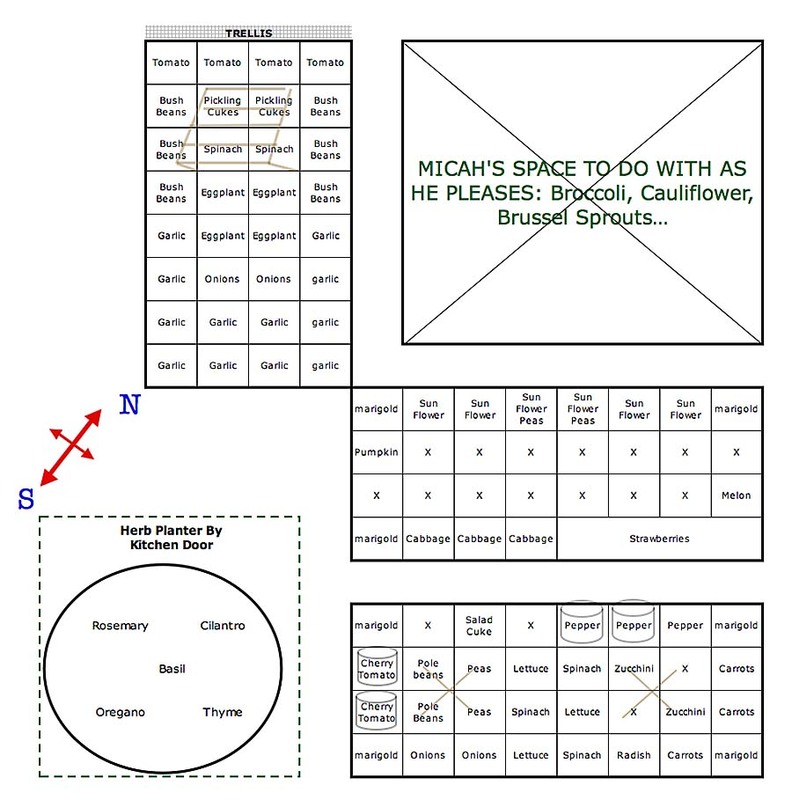 I’m trying a box square foot garden this year, and I’ll be stealing your plan above – I’ll make a list of how many squares and plants for each veggie before I plant. No willy nilly throwing of seeds and hoping for the best. Give your sunflowers at least a two week head start on the peas and you should be okay. I planted a sunflower house two years ago, planting the morning glories at the same time as the sunflowers (per the instructions) and the vines did pull the sunflowers down. However, these were the crimson ramblers and some of the vines were about an inch in diameter! I just planted my sunflowers today for another house, and in a couple of weeks will plant the morning glories plus some moon flowers. Oh the critters! I know we have deer, racoon, red fox, squirrel and chipmunk, hawk, coyote, and groundhog. And the rabbits!!!! We have just put in 3 4×4 boxes and got a few seeds planted today. (It’s getting hot here in the south so I had to get going). Now for a rabbit barrier of some sort. I will be interested to hear what your solutions are. Unfortunately I am unable to offer much advice since we are just getting started ourselves. I will have to remember your suggestion to read less and do more. Thanks! Very nice plan. Peas will not topple sunflowers over. The only thing that may happen is that the sunflowers would shade out the peas. I would try it anyway. Everything else looks fine except that I have always heard that garlic needs to be planted in the fall. The garden will tell you what to do or not to do, that is the best part of gardening. I think I need gardening advice from you after this 🙂 Have a wonderful gardening season. Thanks for the comments and encouragement! The link about deer-resistent plants looks promising. I have no experience with keeping deer out of the garden, being on a suburban block in Australia, though I hear enough to know it can be a daunting task. I was surprised at the absence of raised beds. I had mine installed after I had a stroke that left me disabled and with raised beds I can plant,weed and prune seated in a simple garden chair. I really hope you have a great harvest with this plan as it is apparent that much thought has been put into it. I think your plan is great! It is good that you have goals set for this year. My goal is to try to be more honest about what I will actually eat. I tend to get overexcited when the seed catalogue arrives and plant more than I need. I would think that the peas would be finished before the sunflowers grew very large. Peas are done so early in the summer. Good luck! It sounds like the only REAL error you made in your first garden was not taking more pics to be proud of. You have obviously learned a lot, and hopefully enjoyed most of it – apart from the critter eating bit – I still get sad if something doesn’t sprout or it gets attacked after I’ve waited 10days for it to come up. I had some very old seeds, which I planted, and waited for, and was disappointed. So I got the rest of the old seeds and just planted them, thinking ‘I need 1-2 tomatoes there and 1-2 tomatoes there; I’ll throw the whole pack in and see what comes up’. The whole pack came up. Luckily, in a way, these were the plants attacked (not sure if the birds scratched them up or the dog danced on them) half of them were gone the next day. I am just getting back into gardening after a few years, but I well remember my early attempts 25 or so years ago. I had a wonderful crop of grass as my compost wasn’t ready. I clearly remember standing in my garden saying, “why didn’t I take more notice when I worked beside my Dad in his vegie plot all those years?”. I planted late tomatoes and they were all getting attacked by fruit-fly so I stripped the huge climbing bushes bare and made green tomato chutney. I tried to do the potato thing in a barrel and ended up with composted potatoes – yuk! A pumpkin plant sprang up out the front and I let it grow as I wasn’t ready to put the garden in yet. It took over the entire area and I don’t even remember if I got a pumpkin. However, I also had a lot of wins. My first little bordered garden, with a bit of research on Permaculture and companion planting, yielded so many potatoes and strawberries and other vegies, I couldn’t believe my eyes. A cherry tomato just sprang up and gave us oodles of fly free tomatoes. I turned what was the clay and rubbish pile they had cut out for the building of our house into a flourishing ornamental garden with the aid of some manure and mulch. Even put some swales under the mulch for a bit of fun and found out it works. The whole front garden watered itself from run-off water coming down the side of our house. Have a great second year!